Product prices and availability are accurate as of 2019-04-21 05:17:48 EDT and are subject to change. Any price and availability information displayed on http://www.amazon.com/ at the time of purchase will apply to the purchase of this product. Award-winning CAD Solution DesignCAD 3D MAX is a versatile, easy-to-use 2D/3D CAD tool that's perfect for novice designers, but powerful enough to create high-quality designs, models and animations. This latest release now allows users to import and export 3D models to STL file format for rapid prototyping with 3D printers. It's everything you need to design anything, from simple hobby projects to professional precision drawings. Precision 2D Drafting Tools 3D Solid Modeling Tools Mechanical Design Tools Architectural Design Tools Realistic Rendering Intuitive User Interface Extensive Online Help Windows 64-bit & 32-bit Compatible Choose from our traditional 32-bit version, or install the new 64-bit compatible version, that utilizes expanded computer memory to load, process, and render files of nearly any size. 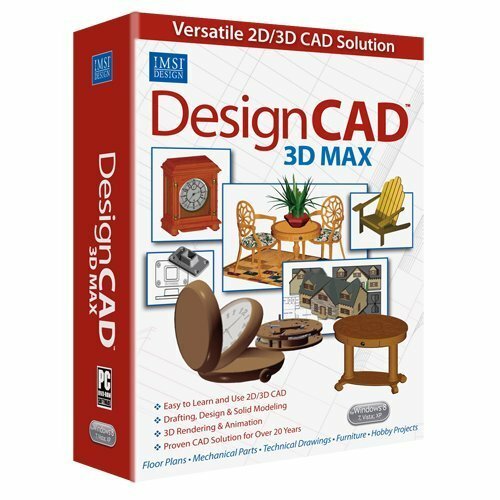 Easy to Learn & Use 2D/3D Design An intuitive interface and extensive online help makes it easy to get started. Design 2D drawings fast and easy. Create complex 3D shapes by simply extruding from 2D shapes. Beautiful Rendering Apply a variety of materials, textures, colors, brush styles, shading and light effects to create stunning images. Customize material textures to further enhance the realism. Architectural Symbols DesignCAD 3D MAX comes with 600 colorful, editable, and fully texture-mapped architectural 3D symbols you can simply drag-and-drop into your design. Animations & Walkthroughs Enjoy user-friendly tools for creating professional level animations and walkthroughs of your finished drawings. Accelerated Drawing Performance Leverage the power of modern graphics cards to zoom, pan, and rotate your designs up to 30 times faster! Install the 64-bit compatible version for even greater speed. AutoCAD® Compatible and more! Share your work in the latest popular file formats like AutoCAD® 2013 - 2016 .DWG and .DXF, .PDF, .WMF and more.